Oeuf is no stranger to stylish and green crib options, and their newest delivery is the Rhea crib. With sleek lines and a modern look, Oeuf is touting Rhea as a “modern twist of their Robin crib.” Finished with non-toxic paints and water-based finishes (without any VOC’s), the crib comes in either a light, neutral-colored birch and white combo or a rich walnut and white combo. The wood is all sustainably sourced from Latvia, where the cribs are produced in a FSC-certified facility. All of this means parents can sleep well at night knowing they made a green choice in cribs. As for baby’s sleep habits, we can’t make any promises, but rest assured, the time he does spend in the Rhea crib will be safe and healthy. Oeuf is no stranger to stylish and green crib options,�and their�newest delivery is the Rhea crib. 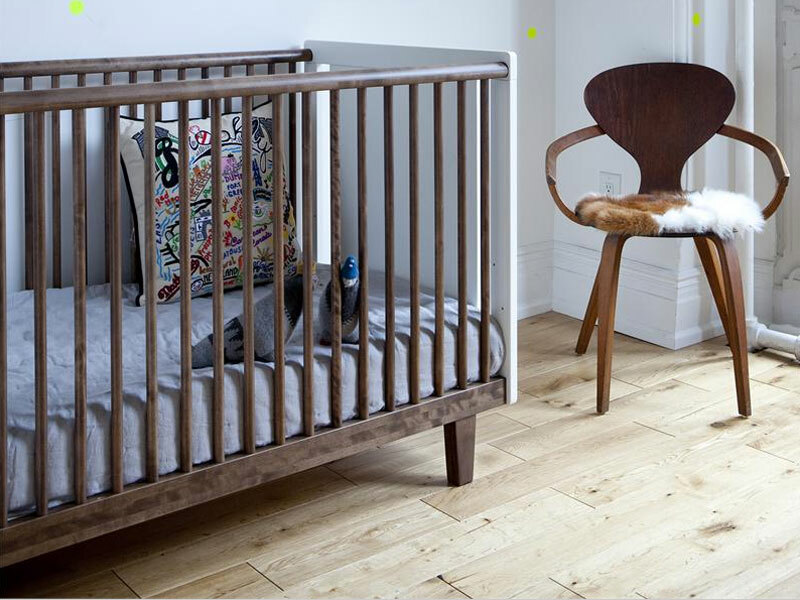 With sleek lines and a modern look, Oeuf is touting Rhea as a "modern twist of their Robin crib." Finished with non-toxic paints and water-based finishes (without any VOC's), the crib comes in either a light, neutral-colored birch and white combo or a rich walnut and white combo. The wood is all sustainably sourced from Latvia, where the cribs are produced in a FSC-certified facility.� All of this means parents can sleep well at night knowing they made a green choice in cribs. As for baby's sleep habits, we can't make any promises, but rest assured, the time he does spend in the Rhea crib will be safe and healthy.